We are huge popcorn fans at our house. HUGE. I won’t tell you how many bags of popcorn kernels we have in our basement! It’s the yummiest snack, and who can watch a movie without popcorn? With Thanksgiving and Christmas just around the corner, I was thinking of fun gift and party favor ideas, and I knew Paper Bag Popcorn would be perfect! 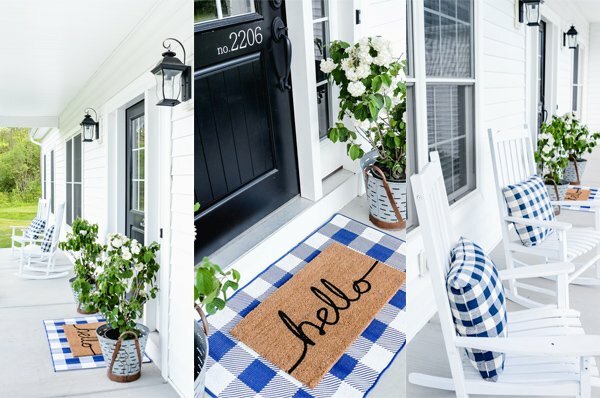 Not only are they SUPER cost-effective, but they’re totally adorable! Isn’t it the cutest? I just love paper sacks! 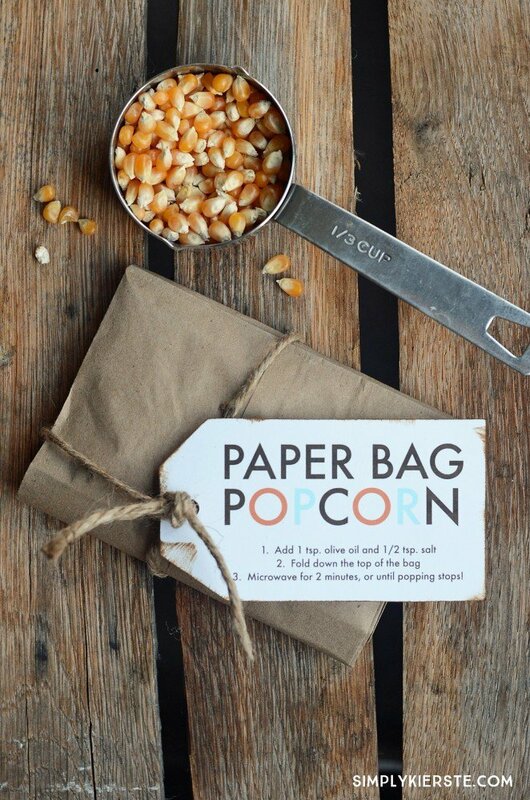 Inside that cute little package is a bunch of popcorn kernels, and on the outside, the recipe for the person you give it to to follow to make easy & yummy Paper Bag Popcorn! These would be adorable on Thanksgiving plates, as part of the decor, and for party favors. Give them as gifts throughout the holidays, and even a cute set of them for a family you know. They are SO inexpensive too, which makes it extremely affordable. With paper sacks around $2-$3 for 100, and bags of popcorn kernels for about the same, one packet is less than 50 cents to make! Add a little twine and a cute tag, and you’ve got a low-cost, super cute gift. 1. In each sack, measure out 1/3 c. popcorn kernels. 2. Fold the bag into thirds, then use twine or ribbon to tie it closed, adding the printable tag that gives the recipient the recipe. They’ll add olive oil and salt, fold down the top of the bag, then microwave for 2 minutes, or until popping stops. Every microwave is different, so it could be a little more or a little less. That’s it! The popcorn is so yummy, and it’s really fun to make it in a paper bag. Click on one of the links below. I’ve included a tag in color, and one in plain brown. Print onto white card stock and cut out! Have you ever tried to make kettle corn this way? My kids love the salty sweet combo. If I were to try this or another flavor, would I add the flavoring after its done popping? super cute, thanks for sharing! what size are the tags? Thank you! The text is about 3 inches by 1.5 inches, but you can leave as much or as little white space all around it, when you cut it out! Love it! 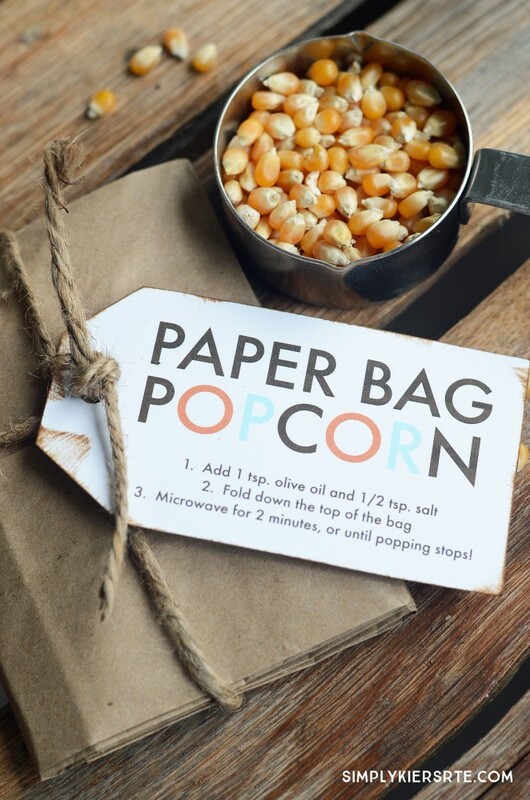 I referenced this post in https://themerrylittlechristmasproject.com/rule-one-gift-idea-paper-bag-popcorn-printable/.